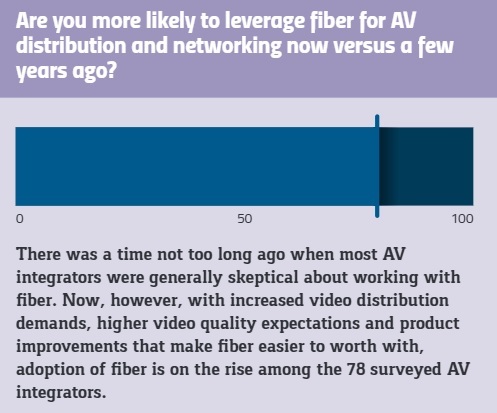 When it comes to AV networking and AV distribution, integrators have more choices than ever. 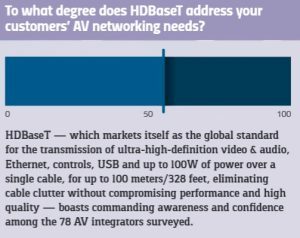 In terms of networked AV connectivity standards, there’s HDBaseT, which allows for the transmission of uncompressed high-definition AV, power, USB, and control over a single cable. 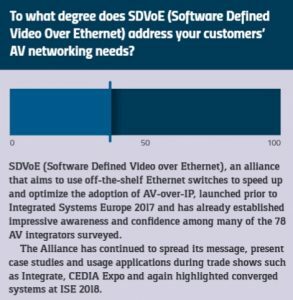 Then there’s SDVoE (software-defined video over Ethernet), a newer technology that enables AV distribution over off-the-shelf Ethernet networks. Then there’s AVB — or audio video bridging. This technology initially addressed the need for guaranteeing the delivery of audio packets in the right order as well as reserving bandwidth for priority routing. Each of these standards has its industry proponents, who assert that their particular technology is the one that can propel the industry now and in the future. Yet for integrators, the most important issue — and the one that ultimately should inform their choice — is which standard can meet best meet both their customers’ needs and budgets. This is an issue which often is not black or white, especially when it is between SDVoE vs HDBaseT. “There are now variants of HDBaseT that work very much like SDVoE,” says Paul Zielie, manager of enterprise solutions at Harman Professional who teaches a class on networked AV distribution systems for AVIXA. Both standards can “provide video lossless systems where you can’t see the compression so they are very good,” he says. Where HDBaseT has an advantage, he adds, is in its installed user base, which in turn contributes to interoperability among HDBaseT products, backwards feature compatibility, and considerable industry know-how for doing network extension. The HDBaseT standard was initially developed by chip maker Valens and the first specification was finalized in 2010. Given its legacy, HDBaseT enjoys significant traction in the AV industry. The HDBaseT Alliance — an industry trade group — has 200 members, manufacturers of HDBaseT equipment that is certified for interoperability. As a standard, HDBaseT accommodates the transmission of ultra-high-definition video and audio over a single cable, for up to 328 feet. As Daniel Shwartzberg sees it, HDBaseT is a simple, reliable and proven technology that AV integrators can deploy for a variety of commercial implementations. “It allows integrators to replace a multitude of cabling with a single cable,” says Shwartzberg, who is the director of customer experience at HDBaseT Alliance. The elimination of dedicated cables translates into simplified, cost-effective installations—plus no encoders and decoders are needed. With HDBaseT, “we are talking about convergence and about extensions, and all without losing any data along the way,” Shwartzberg says. With HDBaseT, a matrix switch is required for switching between different inputs and different outputs. Implementations can range from a simple point-to-point extension from a single source to a single display, or over a much wider network distributing networked AV involving multiple inputs and multiple outputs. HDBaseT is non-blocking, and all the inputs to all the outputs are routed. In addition, HDBaseT can carry USB and AV distribution at the same time — conference room systems complete with multiple microphones and noise reduction along with collaboration software is a typical use case. Contrary to popular belief, Shwartzberg says, HDBaseT can be controlled, managed and monitored over an IP network. Customers already using HDBaseT who are looking to upgrade or add a room, can do so most cost-effectively by utilizing existing infrastructure. Robert D’Addario, president of Cleerline Technology Group, a provider of system cabling and installation solutions,agrees — to an extent. “HD is a great tool in the toolbox for an installer to use with existing infrastructure,” he says. Yet Shwartzberg touts the number of HDBaseT choices available as a major benefit of the technology in that it can facilitate a level of flexibility other standards can’t provide at the moment. “There’s so many manufacturers out there that are selling HDBaseT products that interoperate,so installers have choice,” he says. The having networked AV with IT — eliminating separate networks — means costs are reduced. “You only have one network, one infrastructure to design and deploy,and to maintain and manage,” he explains. As a relative newcomer, SDVoE is not as widely deployed as HDBaseT, yet “it is a very good follow on to the same types of applications you would use for HDBaseT,” says Zielie. If an integrator wants to use SDVoE across multiple switches or multiple WANs, it’s possible, Zielie says, albeit with plenty of thoughts about the specific use case. No matrix switches are required. 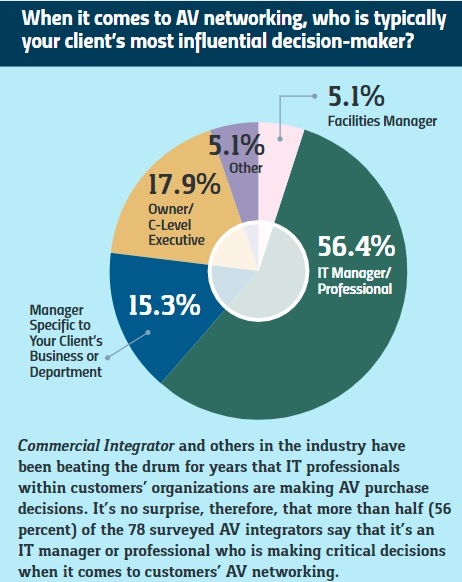 What’s more, that architecture remains the same for every system implementation whether a conference room, digital operating theater, stadium or so on. “You might want to add some hardware if you grow, but from a fundamental perspective, you decide what kind of functions you need — whether extensions and switching, video scaling or other video processing like video walls — and you don’t have to buy a specific piece of hardware for each of those functions,” Kennington says. “It’s just the software that’s different.” And it’s in changing the software, rather than buying, moving or adding to the underlying hardware, that dictate the functionality of an SDVoE system. Karl Johnson, senior product manager at Christie Digital, recently worked on SDVoE-based systems for clients and points to the convergence of functionality as a significant advantage. “You can upscale and add multiviewers to monitor sources and combine things without buying a multiviewer and a lot of receivers,” he says. As a founding member of the SDVoE Alliance, Christie Digital is making a push in the market for SDVoE-compliant equipment. Recently, the company introduced its Terra products that support end-to-end delivery of 4K uncompressed video over 10G Ethernet. 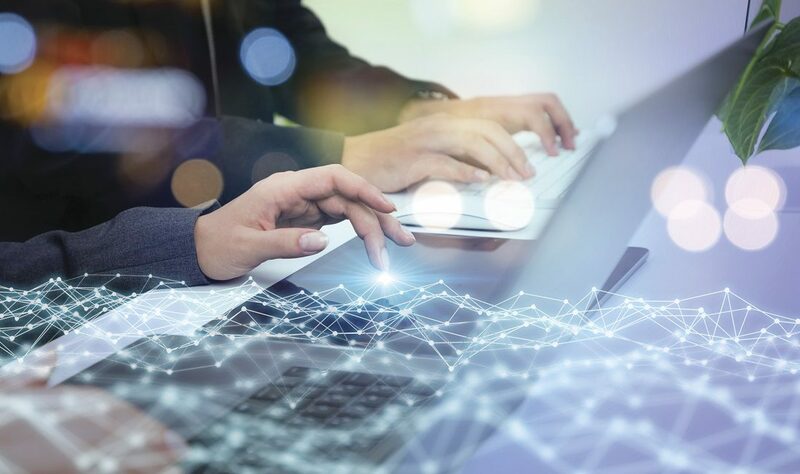 Johnson believes that SDVoE’s ability to combine functionality will in effect serve as the technology’s “killer app” that will propel its adoption. As a relatively new standard, the adoption of SDVoE still presents a learning curve among integrators and perhaps even their customers as well. An integrator needs to have “a lot of AV networking experience and understanding to maximize the potential of SDVoE,” says D’Addario. From the customer’s perspective, SDVoE could represent a different way of doing things in terms of AV. “We’ve been having the conversation about the convergence of networked AV and IT for 20 years, and now SDVoE is here,” says Kennington. While those that advocate either HDBaseT and SDVoE seem to acknowledge that each standard has its particular merits, that’s not the case with audio video bridging, which is often dismissed as an audio-centric standard that doesn’t distinguish itself by solving pressing customer problems. At its essence, AVB is concerned with ensuring that audio and video is delivered in sync. “AVB uses a couple of IEEE protocols for ensuring that the signals will arrive correctly timed or at least in a way that can be easily corrected,” says Kennington. The second aspect of AVB —it has a routing reservation protocol to ensure that the network will find a path to guarantee that bandwidth is blocked off for priority communications. With these attributes, AVB can deliver a level of precision that other standards can’t touch. “The challenge with AVB is that it only works with the IEEE protocols if your network switches support that protocol,” he says. In most situations, Kennington adds, it’s unlikely the AV side of the house gets to specify what switches will be used over the Ethernet network. “The IT director doesn’t want to pull out all the Cisco switches and replace them with ones that support AVB,” he says. 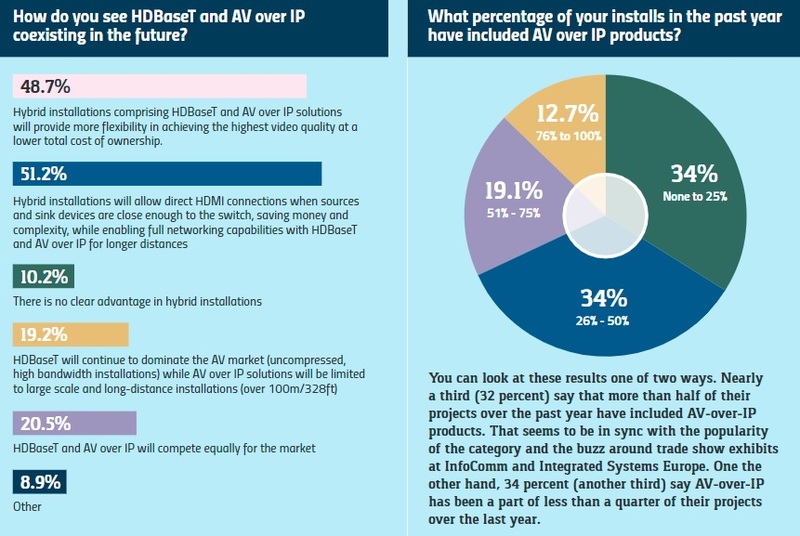 That scenario might be different if there were more AVB-compliant products available; the HDBaseT Alliance’s Shwartzberg says he doesn’t know of many vendors that are in the AVB market. While Ethernet is a ubiquitous AV networking technology, it “is not deterministic — and the arrival of packets cannot be determined or guaranteed,” Kaltheuner says. That’s just the shortcoming that AVB is designed to solve. “AVB works in AV installations very well where timing is critical and extreme reliability without drop-off is needed,” he says. Think large concert venues with many loudspeaker systems and multiple amplifiers. “If these systems are situated in the same room or are displaying the same media, they have to behave as one system,” Kaltheuner explains. 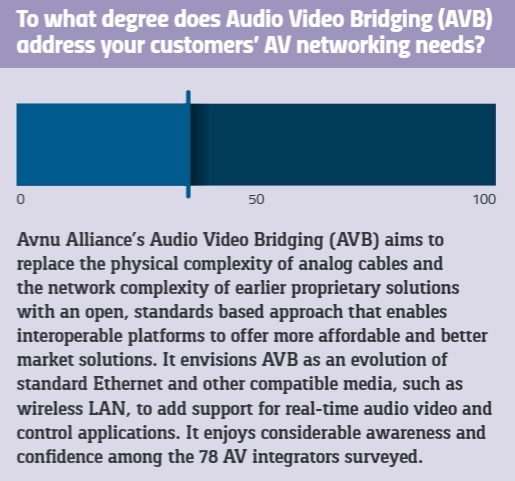 Kaltheuner is involved with the Avnu Alliance, a group of manufacturers out to further promote AVB through the creation of interoperable open standards for low-latency, time-synchronized, highly reliable networked AV devices for use in professional AV as well as other industries. While Kaltheuner concedes that AVB deployment for networked AV distribution has been affected by a dearth of products, the Avnu Alliance is actively working on that issue. Recently, the alliance announced the development of Milan, a network protocol to ensure that devices for professional media applications will work together. What’s the Best Networked AV Solution? It’s natural for proponents of any given standard to profess that that one standard they support is the best for their networked AV clients. However, this in turn leads to considerable confusion among integrators who are looking for the best solutions for their clients. It would be simpler to rank the various standards by their utility, but the truth is more nuanced. Integrators should evaluate each standard in light of best usage scenarios for their customers. 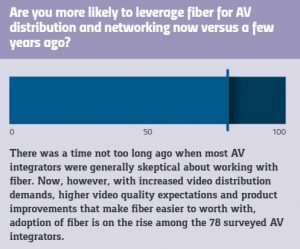 As Yarborough sees it, there’s not much differentiation among the standards for the majority of networked AV distribution applications. “Ten percent of the time, there’s something in in the application that should lead you to one technology over the other,” he says. Megan Santosus is a Boston-area freelance writer. No need to ‘pull out those Cisco switches’ – Cisco now supports AVB! You may have to upgrade, but you can stay with Cisco if you chose. Other companies like Extreme Networks make fine AVB switches, too. Something to consider with AVB for video is that you get extremely simple set-up and control because of the auto-configuration of the switches by the AVB firmware. By utilizing AVB with Biamp Systems products you can install a Dante audio card at one of the Biamp servers and ingest / output Dante audio streams if the AVB audio doesn’t serve your needs The best of both worlds! Also not mentioned, yet worthy of discussion, is the ability to send Dante audio over HDBaseT, and the differences between HDBaseT and IPBaseT.